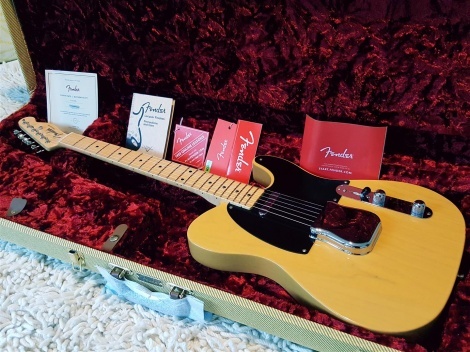 Brand new Fender 2018 American Original 50s Telecaster - Butterscotch Blonde. Unplayed, still in a box, not been a demo. The Telecaster launched a musical revolution when Fender released it. Quickly adopted by working guitarists who were enamored with its trend-setting sound, feel and unique style, the Telecaster laid the foundation for modern country, blues and even heavy metal (in Jimmy Page's hands). The American Original '50s Telecaster has all of the authentic Fender touches that made the Telecaster a star of the studio and stage, adding modern feel and pickup switching to this classic guitar. The nitrocellulose lacquer finish not only lets the body breathe with its true tonal character, it also ages and wears in a personal way. From the bridge to the string tree and tuning machines, every piece of hardware is as the original. This Telecaster features a "U"-shaped neck profile for the substantial fret-hand feel typical of instruments from our original decade. This 9.5"-radius fingerboard is slightly flatter than a vintage-style 7.25" radius, providing a comfortable fret-hand feel. Vintage-tall frets make it easier to bend notes.